Jeans come in a dizzying array of fits and washes these days. But regardless of the style, if you’re seeking a durable pair that will stand the test of time, then focus your attention on those constructed from selvedge denim. Made on a shuttle loom, which creates tightly woven strips of heavy-duty fabric, selvedge denim boasts a technical finish on its edges that reinforces the material and makes it less prone to unravelling, or fraying. Simply put, it’s made of strong stuff. However, selvedge’s unparalleled quality often comes at a price – with many Japanese and US brands (we’re looking at you Iron Heart, The Flat Head and Pure Blue Japan, etc.) pumping out pairs that cost upwards of £200. But we’re here to tell you that it doesn’t have to be this way. A number of high street brands are experimenting with vintage manufacturing techniques to produce affordable selvedge options that won’t hammer your bank balance. Take a look at a few of our favourites on the current market, below. Uniqlo is fast establishing itself as a high street haven for men in search of quality basics – to this end, its everyday jeans are reassuringly comfortable and handsome. This slim-fitting, straight-legged pair is not constructed from raw denim, like so many selvedge jeans are, so they’re extremely comfortable and can be washed regularly without dramatically altering their colour. Wear yours with a hefty turn up (let people see that signature selvedge stitching) and keep things classic with a white crew neck T-shirt and leather trainers to finish. Available at Uniqlo, priced £34.90. When Levi Strauss patented the original design for jeans back in the 19th century, he probably didn’t expect the world to embrace them with such enthusiasm. Yet here we are pulling on the same 501 silhouette as our ancestors did. 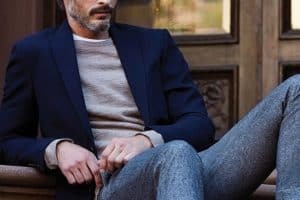 This style has earned its iconic status among modern sartorialists thanks to its ease of wear and versatility – they can be teamed with pretty much everything you already have in your wardrobe. This season, though, try wearing with a pair of suede brogues for a fresh, contemporary springtime look. Available at Levi’s, priced £100. Constructed from beefy 13 oz. premium denim on a vintage Japanese shuttle loom, Gap’s 1969 straight-fit jeans are strong option for anyone who wants to play the wardrobe long game. You see, this style has been dipped multiple times, creating a rich indigo colour that fades and becomes more individual with each wash. 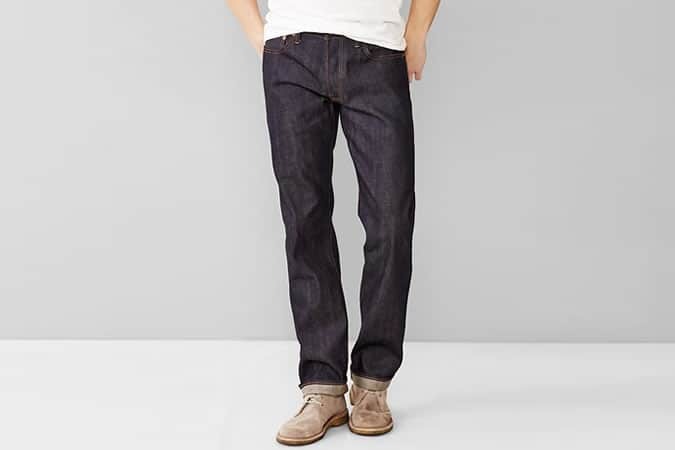 Essentially, this is a pair of jeans that can tell the story of how you live in them – and, of course, whether you’re the kind of man who washes his jeans regularly or just puts them in the freezer to keep them fresh. Available at Gap, priced £64.95. Since launching its menswear brand last year, Whistles has become a firm favourite with style-conscious gents. And when you look at the quality of its denim output, it’s not hard to see why. Like the Gap 1969s, this is a 13oz style in indigo selvedge denim. However, the peculiarly named 06:35 is a trendier fit that features a straight leg that tapers toward the ankle. Available at Whistles, priced £95. AllSaints isn’t all cowl necks and leather jackets, you know. It’s also a purveyor of fine jeans. The brand’s Kieko cigarette jeans, for example, are cut from premium selvedge denim in a modern slim-fit. The dark indigo shade makes them an excellent option for nights out or smart-casual office dress codes – try teaming with a crisp Oxford shirt, unstructured blazer and pair of tan brogues. Available at AllSaints, priced £98.